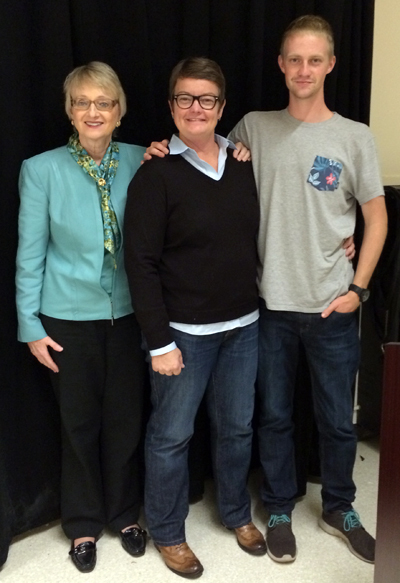 Merrill College alumna Kris Perry, center, stands with her son, Elliott, a UC Santa Cruz sophomore, and Kelly Weisberg, professor of law at UC Hastings College of Law, during a visit to UCSC Monday. “I care about social justice because I care about human rights,” said Perry. Kelly Weisberg, UC Hastings School of Law Professor and founder of the new 3+3 law program in the Division of Social Sciences at UCSC, delivered the opening remarks to the talk. “Kris Perry epitomizes the commitment to social justice that is a founding value of UC Santa Cruz. Her legal case (Perry v. Schwarzenegger, later Perry v. Brown) is a landmark decision in the gay rights movement,” praised Weisberg. Kris Perry describes herself as an ordinary person in an extraordinary situation. She describes how incredibly uncomfortable she felt growing up. “I internalized homophobia.” She shared. It was not until she came to UC Santa Cruz that she became fully aware of her sexuality and was able to come out. Recalling election night in 2008, Perry remembered how a “difficult” thing happened. While Barack Obama’s presidential nomination was a significant win for her and many others, the passing of Proposition 8 deflated the momentous occasion. Perry came to fully realize just how tight elections can be and a majority is closer than one thinks. “Proposition 8 took away the freedom of many,” Perry shared. “There are 1,200 tax and government benefits delivered to you through marriage,” she pointed out. Perry says she realized that if California was going to discriminate against its citizens, she would need to reach beyond the state and make demands at the federal level to create change. In 2008, Perry was working with celebrity activist Rob Reiner at First 5 California, a state government agency he founded dedicated to child health development. Reiner asked if she and Stier would be interested in joining lawyers Ted Olson and David Boies and fellow plaintiffs, couple Paul Katami and Jeff Zarrillo, to sue the very government she worked for. Perry’s case and trial inspired Academy-award winning screenwriter Dustin Lance Black (Milk, J Edgar) to write a theatrical version of her story. He based his play on testimony transcript and court documents. It was because of that stellar legal team that she and Stier decided to do it, she said. Boies, a Democrat and Olso , a Republican (who fought each other in the infamous Bush vs. Gore case) had come together to fight on behalf of the two couples. The bipartisanship was incredible, Perry observed. 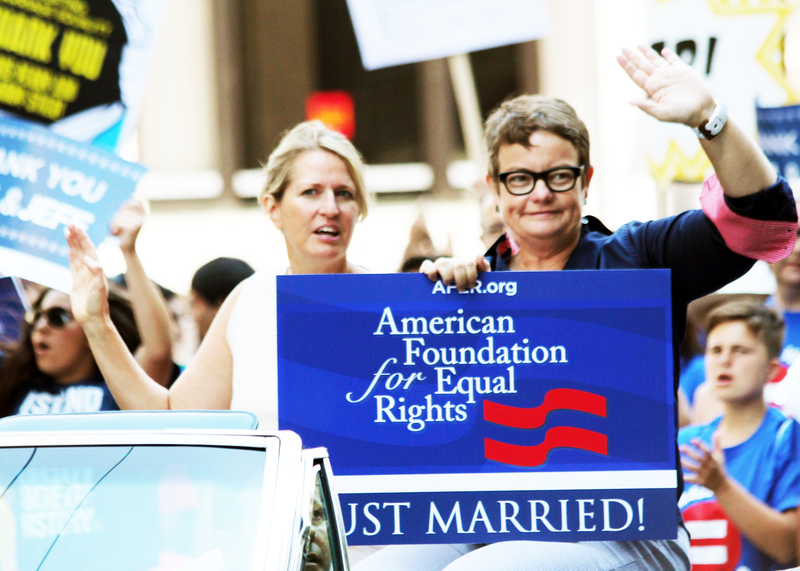 In 2010, Proposition 8 was overturned by the Ninth Circuit Court of Appeals. The case was then upheld by the U.S. Supreme court on appeal. Perry has a prominent career in the child advocacy and policy field. In 2012, Perry was appointed Executive Director of the First Fives Years Fund, a bipartisan advocacy group devoted to early childhood education for disadvantaged children. Perry married Stier for the third legal time in June 2013. Perry and Stier currently live in Washington, DC and have four grown children.